I have surrendered myself to my Lord and Master. Now that I have sought your protections, O my Lord Master, save me or finish me. I have destroyed the cunningness and the cleverness of this world. Whether someone speaks good of me, or some speak ill of me, I have surrendered my whole self to You. Whoever seeks refuge in you, O God, You always save by Your merciful grace. Servant Nanak has entered your sanctuary, dear Lord; O venerable God, please, protect his honour. ਹੁਣ ਮੈਂ ਹੋਰ ਸਾਰੇ ਆਸਰੇ ਛੱਡ ਮਾਲਕ ਪ੍ਰਭੂ ਦੀ ਸ਼ਰਨ ਆ ਗਈ ਹਾਂ। ਪ੍ਰਭੂ, ਹੁਣ ਮੈ ਤੇਰੀ ਸ਼ਰਨ ਆ ਗਈ ਹਾਂ , ਚਾਹੇ ਮੈਨੂੰ ਰੱਖ ਜਾਂ ਮਾਰ, ਜਿਵੇਂ ਤੇਰੀ ਰਜਾ ਹੈ ਉਵੇਂ ਮੈਨੂੰ ਰੱਖ. ਦੁਨੀਆ ਵਾਲੀ ਸਿਆਣਪ ਤੇ ਦੁਨੀਆ ਵਾਲੀ ਵਡਿਆਈ ਮੈਂ ਪਿੱਛੇ ਚਡ ਆਈ ਹਾਂ। ਚਾਹੇ ਮੈਨੂੰ ਕੋਈ ਚੰਗਾ ਆਖੇ ਜਾ ਮੰਦਾ ਆਖੇ ਮੈਂ ਤੇ ਆਪਣਾ ਸਭਕੁਝ ਠਾਕੁਰ ਅਗੇ ਭੇਟ ਕਰ ਦਿਤਾ ਹੈ. ਹੇ ਪ੍ਰਭੂ, ਹੇ ਮਲਿਕ, ਜਿਹੜਾ ਵੀ ਤੇਰੀ ਸ਼ਰਨ ਆ ਪੈਂਦਾ ਹੈ ਤੂੰ ਮੇਹਰ ਕਰ ਕੇ ਉਸ ਦੀ ਰੱਖਿਆ ਕਰਦਾ ਹੈਂ। ਹੇ ਪ੍ਰਭੂ, ਹੇ ਕਿਰਪਾ ਦੇ ਸਾਈ, ਨਾਨਕ ਤੇਰੀ ਸ਼ਰਨ ਆਯਾ ਹੈ ਤੂੰ ਉਸ ਦੀ ਇਜ਼ਤ ਰੱਖ. What a beautiful shabad. 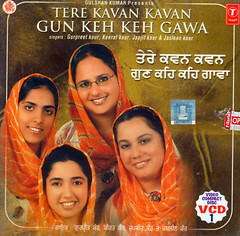 May Baba ji look upon Gurpreet, Keerat and Japjit Kaur and they carry on producing such gems from Guru ki Bani. The way the Shabad is sung, it is very sooting and gives the sense of peace. It’s great that the shabad is translated into English so that the younger generation can understand. Also thank you for explaining the shabad in punjabi it helps to understand. Many many thanks for singing the shabad so nicely. I am very new to this blog, listened to this shabad. I must say simply awesome. It actually glued me to the shabad. I must appreciate the translation done. It made it very easy for me to understand the spirit. Since I first received the Shabad “Madho Hum Aise Tu Aisa” I and my wife have been enjoying your recitel almost everyday. It has become almost a ritual with us. It has been an overwhelming experience something out of this world. It helps us in becoming one with the Almighty. I want to express my gratitude from the core of my heart for such wonderful creations. You people are doing a wonderful SEWA. Keep it up. May God bless you with many more such creations in all times to come. Thank you for sending me this blog–ABB HUM CHALI THAKUR PAY HAAR’. Nicely sung in Rag Devgandhari. 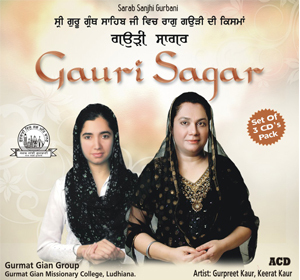 Its theme–‘Self surrender to God’–is so nicely as the way sung in such melodious voices. Wahiguru bless you ! Thank you for sending me this blog–ABB HUM CHALI THAKUR PAY HAAR’. Nicely sung in Rag Devgandhari. 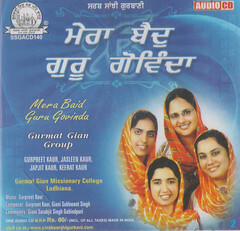 Its theme–’Self surrender to God’–is so nicely as the way sung in such melodious voices. Wahiguru bless you ! Thanks everybody. Do keep visiting this Blog and keep giving useful comments. Beloved Wahegurujio is Great and keeps us in his charna with his beautiful shabad and love through our beloved sikh brothers and sisters…Thankyou Beloved Wahegurujio and beloved fellow sikhs…Jai Jai Jag Karan! 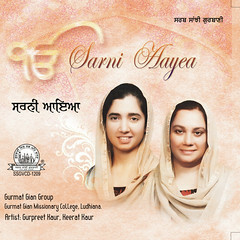 Very sweet and enchanting keertan singing. Mesmerising indeed !! What a beautiful shabad. Soooo pleasant to listen to. God Bless you ! This shabad has special significance for me thank you for sharing this, it comes at a time when it is taken most deeply to heart. 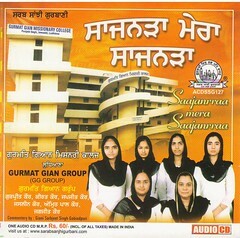 Many2 thanks to all of you who are blessing withgurbani kirtan. Waheguruji bless you naam daan. thank you so much, this is so so so beautiful. waheguru ji ka khalsa waheguru ji ki fateh.,.,. amazing… really awesome././,., very heart touching,.,. Thanks for the appreciation. I am from Raikot, Ludhiana. We can meet when you happen to come this side. 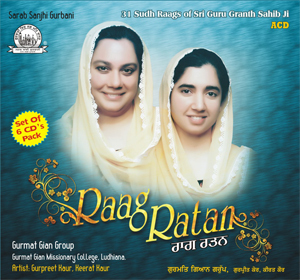 Just to inform you my new Album of 6 CDs which is a Compilation of All the Shudh 31 Raags of Sri Guru Granth Sahib Ji, is ready and may be released in the month of Nov. this year. Thanks and do keep visiting the Blog for many more Gurbani Shabads. In true words its you who is in full association with Him. God bless us all, is my earnest prayer. Sahib Sri Guru Arjan Dev ji di uchari bani “Poota Maata kee Asees” de anusaar Maata-Pita’s blessings are always with all of you. Blessed people. Thanks.